Arsenal defender Andre Santos is unsure whether team-mate Robin van Persie will remain at Arsenal after the 'best season' of his career. 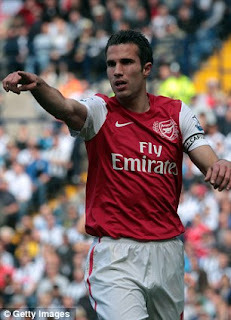 Holland international Van Persie netted 30 Barclays Premier League goals for the Gunners, who finished third and qualified for the Champions League. Such performances have seen the 28-year-old - whose contract expires in the summer of 2013 - linked with a move away from the Emirates, with Manchester City mooted as a possible destination. 'He's amazing,' he told ESPN Brasil. 'Besides being a great person, he is also one of my best friends at Arsenal. He is a guy who has given me full support. 'He is very intelligent on the pitch. He smashed the Premier League. 'It helped Arsenal get to where we are, in the Champions League spots, and I have no doubt that he will be one of the stars of Euro 2012. 'He has been at the club eight years and this was his best season. 'Sometimes, a player is interested in getting to know other teams and of course, playing well, he has attracted interest from many other teams. Of course your mind is affected.